Examining a patient’s skin and identifying potential skin cancers are the responsibility of every clinician in every medical specialty. Certainly specialists in primary care and dermatology take the lead in skin cancer detection, but practitioners in many other medical specialties also have the opportunity to examine the skin. All clinicians—from the orthopedic provider, who may examine the arm and shoulder for a rotator cuff tear, to the ear, nose, and throat provider, who may tug on the patient’s ear and feel roughness at the top of the pinna (Figure 1)—have the opportunity to identify a potential skin cancer or precancerous lesion. There are more new cases of skin cancer each year than of breast, prostate, lung, and colon cancers combined.1 This means that as clinicians, we need to be more aware of how skin cancer detection can become a part of almost every medical visit. Figure 1. 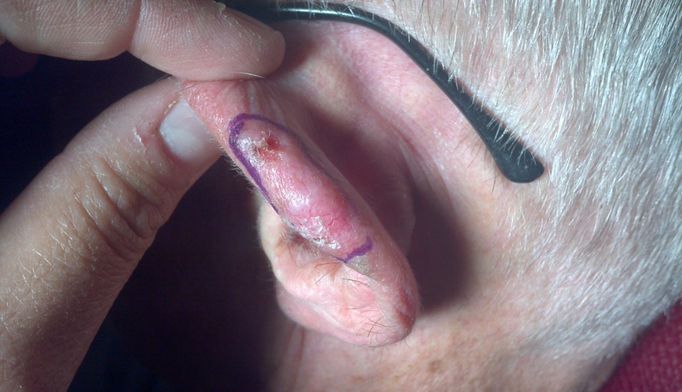 Basal cell carcinoma on the ear. Early detection is one of the most important prognostic factors in the long-term survival of a patient with skin cancer. The early discovery of a skin cancer can be the difference between life and death, or between office-based surgery and surgery, radiation, and chemotherapy. As long as you have the opportunity to view a patient’s skin, you have the opportunity to identify a skin cancer and potentially save that patient’s life. Which of the following is part of your routine evaluation of patients regarding skin cancer? 1. ABCDE mnemonic. This is widely endorsed in the medical community and presented to patients. A stands for asymmetry; if you draw a line down the center of a lesion, is each side a mirror image of the other? B stands for border; does the lesion have a clear, circular border, or is it oddly shaped, like a paisley motif? C stands for color; is the lesion of the same color throughout? D stands for diameter; is the diameter of the lesion greater than 6 mm? E stands for evolution; a new lesion or one that is changing should raise the clinician’s index of suspicion. Evolution may actually be the most important predictor within this tool. Ask your patient how long the lesion has been present and if it is changing in any way. In a retrospective study, the sensitivity of the ABCDE system for identifying a lesion as a melanoma was 97% when 1 of the 5 criteria was used and 43% when all 5 were used jointly.4 By contrast, the specificity was 36% when a single criterion was used and 100% when all 5 criteria were used.4 Sensitivity is the percentage of suspicious lesions that are correctly identified as melanomas (true diagnosis). Specificity is the percentage of suspicious lesions that are correctly identified as not being melanomas. 2. Glasgow 7-point checklist. This is another set of criteria for referral or biopsy. The presence of any major feature (see sidebar below) is an indication for biopsy. Additionally, the presence of any of the minor criteria reinforces the need for biopsy. As stated above, the emphasis on change as a crucial diagnostic factor should be noted. One small study found a sensitivity of 100% and a specificity of 37% when the Glasgow checklist was used in the diagnosis of 65 melanomas and 100 benign pigmented lesions.5 However, this system is less widely used and therefore less well studied than the ABCDE system at present.